If pizzas were pants, Incotex would be legendary pizzeria Da Michele of Naples, Italy. Visitors to Da Michele’s original Neapolitan location choose from a menu offering just two options: a Margherita or a Marinara. When a restaurant can offer such a limited choice of dishes and yet still achieve the global fame of Da Michele, you can be pretty certain that the product is going to be absolutely top rank. While Incotex offers considerably more options than it’s pizza-pushing compatriots, the Venetian brand has established its name due to a similar degree of specialization: you go to Incotex for pants, and only pants. Unfortunately, after it’s buffalo mozzarella Margheritas were bigged up by Julia Roberts in Eat Pray Love, waiting times for a simple sit-down lunch at Da Michele’s are on average between one and two hours. While Incotex pants have become similarly sought after, thankfully they are somewhat easier to track down. Earlier this year I grabbed myself a pair of the brand’s Sky Slim Jeans in a linen-cotton mix, and am now eagerly awaiting the arrival of Summer in order to get them fully broken in. Here are my impressions in the meantime…. While scrotum-squeezing drainpipes are finally on their way out, these particular “slim” jeans are cut to a more measured degree of skinnyness, so they should still have a good amount of life left in them before making me look like a mid-Noughties hangover. This is fairly typical of Incotex: a brand you go to for longterm quality, not cutting edge looks. In any case, the faded grey tone is perhaps more 1977 than 2007, and comes across nicely “aggro” when paired with some heavy leather boots, so I dare anyone to tell me they’re unfashionable. When viewed flat, the odd-shaped, curved-edge back pockets initially struck me as overly fussy. However, this aerodynamic design suddenly make a lot more sense when the item is worn: the pockets are clearly cut to follow the contours of the wearer’s body, so once wrapped around the three dimensions of a firm derrière, they suddenly look reasonably straight. Made from a pleasing mix of 59% linen and 41% cotton, these are excellent jeans to wear in a hot climate – instead of suffering under some stiff-as-a-board 21oz raw selvedge denim. 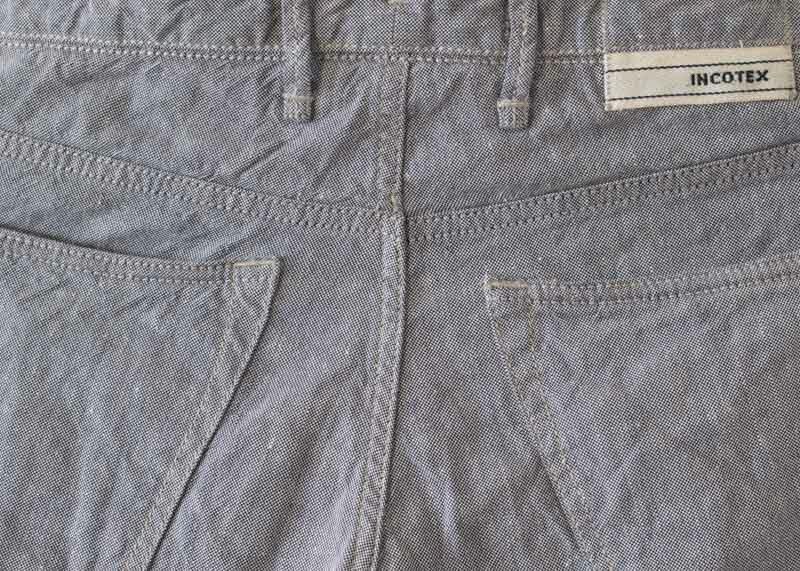 However, the one thing that linen is not especially suitable for, it seems, is rolling up: unlike heavy cotton denim, the hems of these pants don’t stay in place too well when I try to turn them up at the bottom. Although to be honest this doesn’t stop me from wearing them in this way all the same, it just means that they don’t sit quite as nicely as regular jeans do, and the roll frequently needs to be readjusted throughout the day. Finally, despite not having owned these jeans all that long, there are already a few fibers coming loose from the fabric. Although it’s unclear if this is due to wear or just down to the natural slub of the linen. I’m inclined to think (hope) that it’s the latter, but only time will truly tell. The “slim” cut aside, Incotex’s sizing is definitely on the smaller end of the scale. Depending on brand, a good fit for me on the waist is usually around a 29. Sometimes a 30, other times even a 28 (yes, I know…). Instead, these are a size 31 and fit just right. On this evidence, you’d do well to size up a measure or two if ordering online. Be warned that the waistline on these is very low. I know that this is kind of part and parcel of the skinny style, but after a few years of wearing higher-waisted pants, I find the extreme low cut of the Sky Slim a little annoying (if I wanted to display my underwear to the world I’d wear it over my pants, thank you very much). However, I expect I’ll change my mind about this come summer, when all those high-waisted woolen numbers will inevitably be flung to the back of the closet in heatstroke-induced frustration.